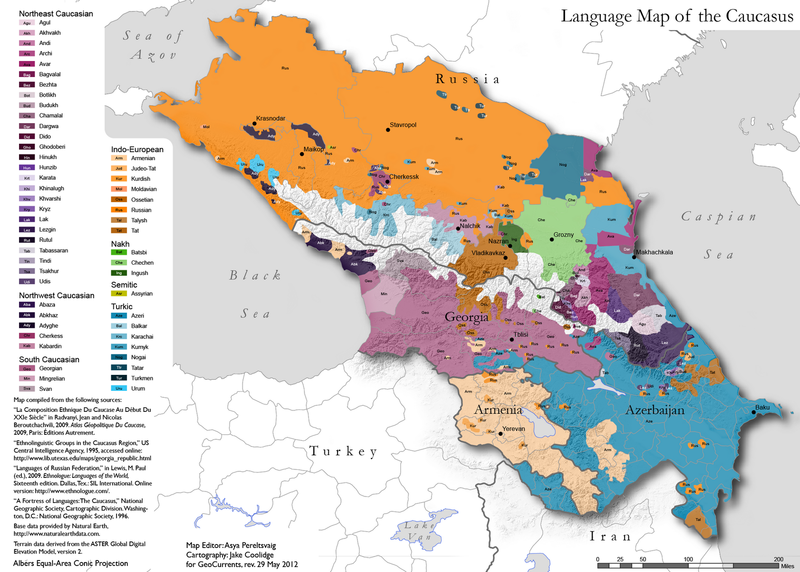 Drawing on previously available ethnic and linguistic maps, supplemented by demographic data from other sources, we were able to create two linguistic maps: one representing the whole Caucasus area and the other zooming in on the particularly linguistically diverse region of Dagestan. Our first task was an accurate representation of the spatial distribution of various groups, unlike what is found in previously available maps, which often over-represent or under-represent the extent of linguistic groups. We have used the most recent census data available to capture the wholesale migrations, episodes of ethnic cleansing, and population exchanges that have changed the situation on the ground. Careful mapping of smaller linguistic groups, especially in Dagestan, has proved particularly instructive, as it allowed us to represent visually the correlation of language and topography, something that has not been done before. Having Jake Coolidge on board for this project was especially valuable, as he has employed modern cartography techniques to overlay the linguistic map on a detailed topographic representation. Finally, a careful use of the color scheme allowed us to demonstrate the family relatedness of the various languages spoken in this region, known justifiably as “the mountain of tongues”. The general map is reproduced on top left. Here is the link for the Dagestan-specific map. The GeoCurrents site itself seems quite interesting. Excellent work, many thanks for this. It answers questions I've been harboring for quite some time. I am not a big fan of language studies. But this map is interesting. The spots of colour are (mostly) relict populations telling you something about what came first. Clearly Turkic and Indo-European political influence have washed back and forth through this area several times as show by the orange spots in the south and the blue spots in the north. Both have overlaid an older Caucasian base. I wonder if that spot of Assyrian was a single powerful land holder forcing his estate to speak his language? A good many of the Assyrians in the Caucasus, Ukraine, Russia, etc., are relatively recent arrivals (~100 years). My grandfather's journey was Iran --> Georgia --> Ukraine --> Kazakhstan --> Iran --> United States. Map contains lots of inaccuracies. For example: southwestern province of Georgia (Samtskhe-Javakheti) populated mainly by Armenians. Simultaneously Armenian enclave shown at southwestern part of Azerbaijan since the 1993 had merged to rest of Armenia & there's no longer Azerbaijani areas between them. Dienekes, who are the Urums living in Krasnodar Region? Do you have any ethnic origin information about those people? Why they are named Urums and Speaking Turkic?